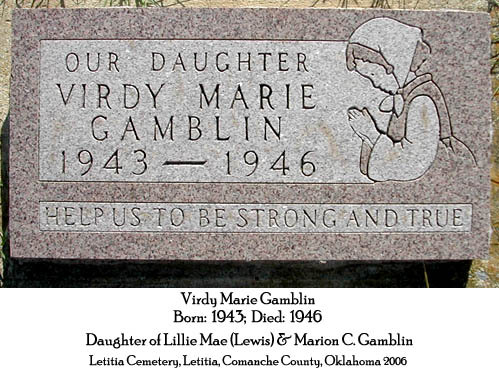 Letitia Cemetery, Highland Cemetery, Flower Mound Cemetery, and Sunset Memorial Gardens are four cemeteries located in Comanche County, Oklahoma where we find some of our family. To see the Dickens family buried in Comanche County, please visit Dickens Family Burials. On this page, you will find pictures of grave markers and obituaries. If I have the obituary and a picture of the marker, the obituary will be linked from the picture of the marker. 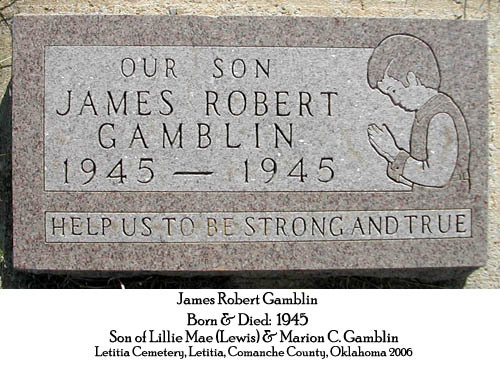 Visit the Other Cemeteries page to find those buried in other Oklahoma Cemeteries as well as other states. We have several ancestors buried in Arkansas Cemeteries. I have made individual pages for other cemeteries that have so many of our family members. Please visit Thorn Cemetery, Sandhill Cemetery, Haskell County Cemeteries, McIntosh County Cemeteries, Muskogee County Cemeteries, Pawnee County Cemeteries, and Tulsa County Cemeteries to see the markers there.